Car of the Year photo gallery | What Car? 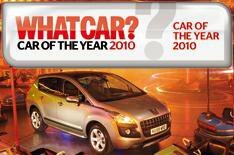 The Peugeot 3008 scooped our What Car? Car of the Year Award, but here's your chance to enjoy all the winners with our exclusive Awards gallery. Just browse the category winners below and click on the thumbnail images to reveal a larger version of all the winning cars. The photography was overseen by our chief photographer John Bradshaw and was filmed on location at the Fairground Heritage Trust, located in Lifton Devon. For more information visit the website at www.fairground-heritage.co.uk. Just click the thumbnails for a larger version of the photos.